We hope you can come. Please RSVP if you plan to attend. FREE! but donations are welcome! Our museum docents Jennie, Bernie, Olivia and Beth will be giving tours this weekend, 1pm - 4pm. They will share their knowledge of this rare historic landmark and of the family who built it. Our Oktoberfest event was fantastic - with record breaking attendance. If you came to that event - thank you for your support!!! If you haven't ever been to Oktoberfest, check it out next year. It is always the third weekend in October. Our Annual Meeting is November 4th at 6pm at the Visitors Center. It is open to our members - and to the public. Please RSVP if you plan to come. The guest speaker is Hettie Ballweber who will make a presentation about the archaeology of Schifferstadt. Details will be posted here shortly. Celebrate fall on the grounds of a picturesque, historic German farmhouse. 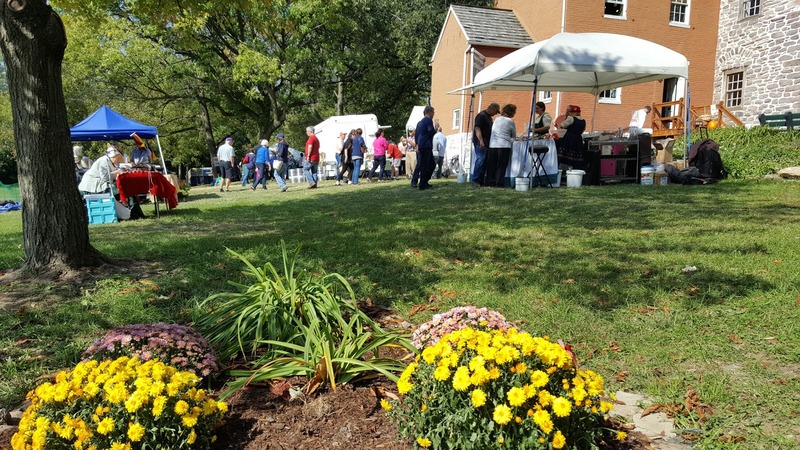 This traditional festival features juried arts, crafts, cultural activities, German sausage, beer, strudel, and oompah band, and colonial history demonstrators and children’s fun. 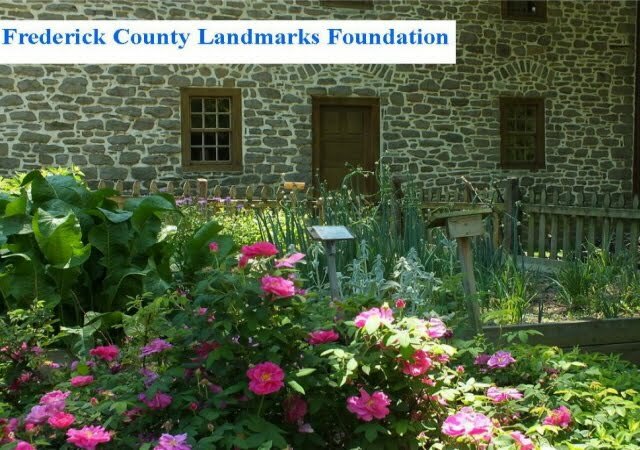 Event hours are Saturday, 10 a.m. to 5 p.m. and Sunday, 12 noon to 5 p.m. www.FrederickLandmarks.org. Over 34 artisans and many historical demonstrators and presenters are featured. 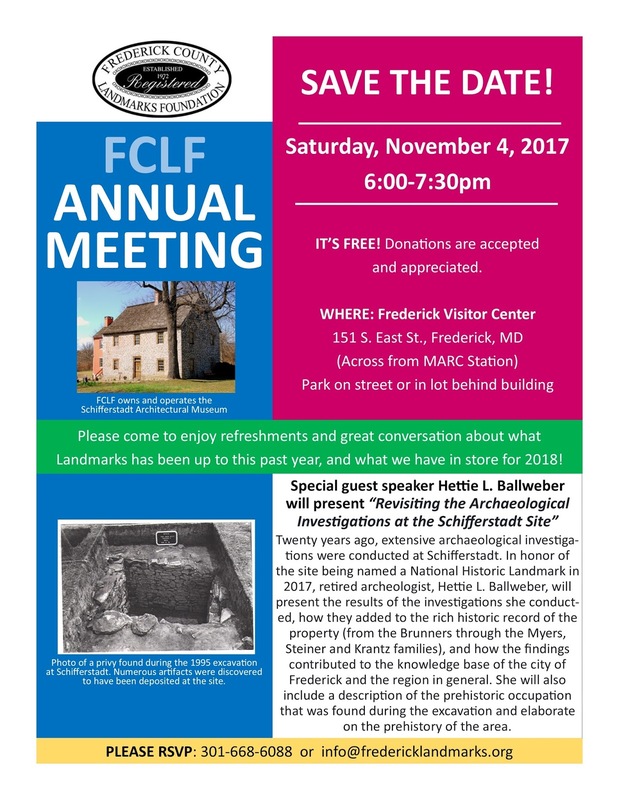 Contact 301-663-3885, or email info@fredericklandmarks.org for details. Rotary of Fredericktowne is our partner in hosting this event. Tours of Museum are offered for a discount. (12 and under free). 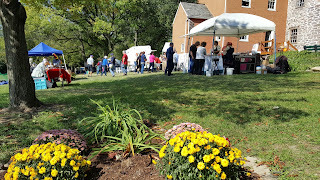 Proceeds help maintain Schifferstadt. Oktoberfest is October 21st , 10am - 5pm, and October 22nd, 12noon - 5pm. In addition to all of the festivities on the grounds (see below) we will be conducting tours of the museum. Due to high demand, it is best to email or call to reserve a time for a tour. The museum is open Oct. 7th & 8th from 1pm - 4pm. The museum is open October 14th & 15th from 1pm - 4pm. 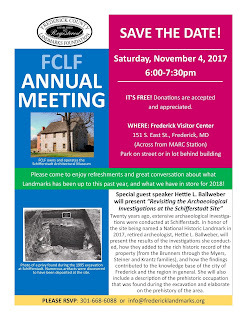 Contact 301-663-3885, or email info@fredericklandmarks.org for details.